To book a workshop and discuss the details contact me: info@judithroberts.com.au. For the last 10 years I have conducted Raku Firing Workshops and Demonstrations in schools, Community Arts Organisations and Tertiary Institutions. I have worked throughout the Melbourne metropolitan area as well regional victoria within 100 kilometres the CBD. Workshops may be run during the cooler months from April-October. To secure a workshop booking contact me from March onwards each year. Individuals not connected to a group may contact Northcote Pottery to join one of my public workshop held 2-3 time per year. The workshops usually run from 9am-4pm and work best with a maximum 10 participants. With the 2 x kiln set up I can fire 6 - 7 loads of pieces in a workshop day. In the school settings there are often many more than 10 students intending to fire one or two small pieces each. In this case the glazing is done all at once at the beginning of the day. I then fire throughout the day. By observing the 'theatre' of Raku students experience the excitement of this dynamic firing process and immediately witness the finished pieces as they are extracted from the post firing reduction bins. 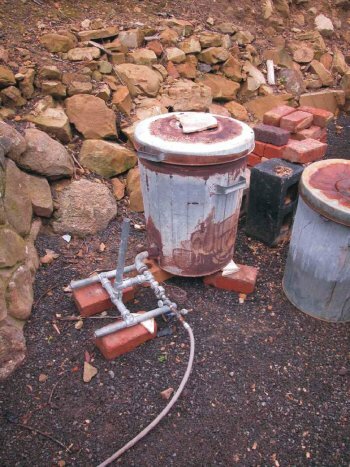 I bring all Raku firing equipment to the school or institution including pre mixed glazes, and, in consultation, with the organiser choose a safe site (see workshop needs page). When working with community arts groups or at tertiary institutions there are often additional kilns available. I can fire a third kiln by negotiation. 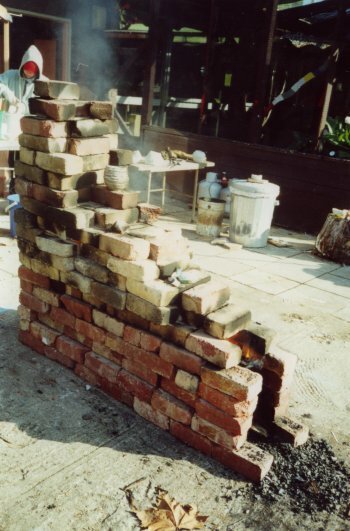 I have experience building and firing Wood fired Raku kilns, using split fence palings as fuel. I have constructed a number of these at workshops where there is a supply of bricks and palings. It is possible to build then fire a wood kiln up to temperature once, from scratch, on the day while firing the bin kilns as usual. I carry full public liability insurance.